Plan Your Next Coffee Date Over Honey Vanilla, Caramel Hazelnut Or Blueberry Cold Brew! The Baba’s Beans coffee maestros have opened up their own cafe and this is where your search for the perfect coffee date ends. The cafe is situated in Vivanta by Taj in Khan Market and they’ve got their delicious roasts ready and waiting for you. Baba’s Beans, till now, had their addiction and passion for coffee restricted to home deliveries, but now they’ve gone brick and mortar and we can’t help but keep going back for seconds and thirds. They’ve got a breezy outdoor area for perfect winter date nights and an indoor seating for when the summers hit. They source their coffee beans from the majestic Western Ghats and have been a delicious aid to the students pulling all-nighters on their assignments and coffee connoisseurs looking for their next caffeine fix. Their varied menu includes hot brews like Doppio and Espresso Con Pana; Vietnamese Cold Brew and Caramel Hazelnut Cold Coffee in the cold section; and single estate origin coffees like Harley Classic from Karnataka, Araku Valley from Andhra Pradesh, and a whole lot more. You’ll also find teas like masala chai and green tea on the menu, along with small bites like crostinis and quiches. 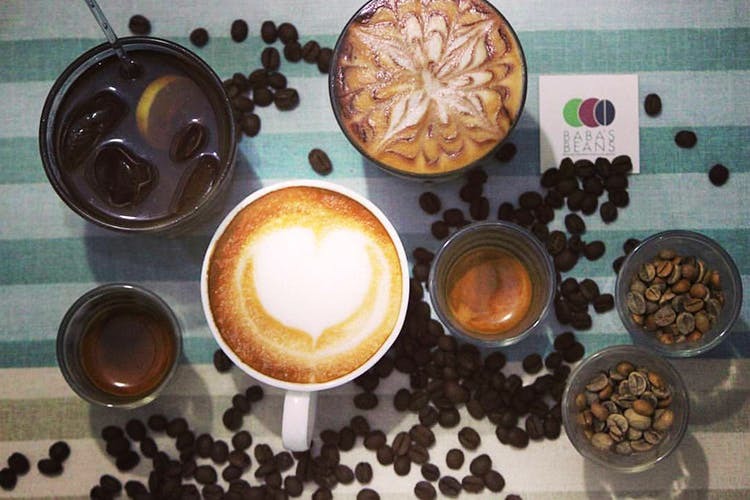 If you’re in need of the perfect pick-me-up, treat yourself to some exotic and quality coffee at Cafe Baba’s Beans.